As is so often the case, I don't think much of the blurb for this one, compared to the actual story. That's neither here nor there, as the blurb was enough to get me interested, and the story was better and more interesting than it suggested. Nisha's diary is her main voice. She's not physically unable to talk, but as I read it, so introverted that talking to much of anyone besides her twin brother is almost impossible for her. So a part of the story here is Nisha coming to grips with speech and silence--in a time when speech may be the far more dangerous choice. The book, realistically, doesn't give her a miracle cure. It just gives her a voice in the form of her diary. The story, like many middle grade books, is at base about family. That's not to diminish the way in which it sheds light on a pretty awful moment in history (could the independence of India and the partition have been handled better? It certainly seems like it). It's a window for younger readers into an historical moment they may know little about. But in the end, the real question is who is family, and what constitutes family in a time when the government and many violent people are all saying that the answer to that question revolves around religion. 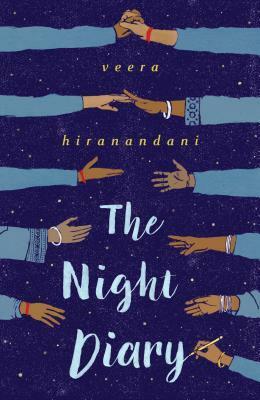 Nisha's family is transgressive from the beginning, because her parents married across religious lines, angering many on both sides of the family as well as creating a built-in danger in a time of growing intolerance. The creation of Pakistan made that worse, as it did for millions across what once was a single India. The journey Nisha and her family take is in search of safety, but each step is also a search for family, and in the end, that pull seems to be stronger than any lasting resentment for the marriage that crossed lines most thought should never be crossed. Nisha may not find her voice by the end of the book, but she does find peace, and a sense that life can go on. This is suitable for kids from about 10 or 11 up, as some of the scenes of violence might be disturbing to younger kids (and whatever age reads it, it would be worth having a conversation about what led to so much violence). Any reader will get a stronger sense of what those chaotic days were like, and the disruption to the country that followed independence. FTC Disclosure: I checked The Night Diary out of my library, and received nothing from the writer or publisher for my honest review. The opinions expressed are my own and those of no one else. I am disclosing this in accordance with the Federal Trade Commission's 16 CFR, Part 255: "Guides Concerning the Use of Endorsements and Testimonials in Advertising." Um, good luck with that? Sounds like a powerful read. And I have read other books about this time period, and it was very violent. Yes. Most of what I knew about it was from watching the movie Ghandi, but that's enough to tell you it was a bad time to be there, and to be a kid.